Crème de cassis (pronounced: [kʁɛm də kasis]) (also known as Cassis Liqueur) is a sweet, dark red liqueur made from blackcurrants. It is made from blackcurrants that are crushed and soaked in alcohol, with sugar subsequently added. While crème de cassis is a specialty of Burgundy, it is also made in Anjou, England, Luxembourg, Quebec and Tasmania. The quality of crème de cassis depends upon the variety of fruit used, the content of the berries, and the production process. If it is labelled "Crème de Cassis de Dijon," one is guaranteed berries from the commune of Dijon. In 2015, the new protected geographical indication (PGI) “Crème de Cassis de Bourgogne” has been approved. Promoted by a syndicate of fruit producers and liqueurs companies from Burgundy. 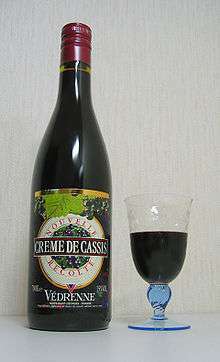 This "Crème de Cassis de Bourgogne" guarantees the burgundian origin and the minimum quantity of berries used in its production, essentially the variety Noir de Bourgogne. Nearly 16 million litres of crème de cassis are produced annually in France. It is consumed mostly in France but is also exported. ↑ Duplais, Pierre & Duplais, Pierre, Jr (trans. by M. McKennie) (1871) A Treatise on the Manufacture and Distillation of Alcoholic Liquors Philadelphia: Henry Carey Baird. page 518. 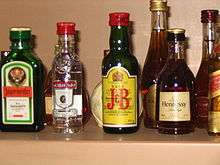 ↑ Marianski, Stanley & Marianski, Adam (2012) Home Production of Vodkas, Infusions & Liqueurs Seminole, FL : Bookmagic LLC. page 265. ISBN 9780983697343. ↑ Agatha Christie, Dead Man's Mirror, 1986, page 184. ↑ Agatha Christie, The Clocks, 1963, page 145. ↑ Agatha Christie, Hercule Poirot's Casebook, 1984, page 320.